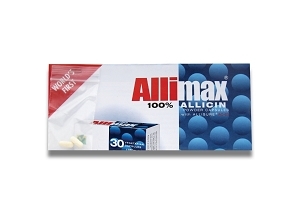 Allimax - Free Sample - 100% Allicin! Ingredients: AlliMax® capsugel vegetarian size 0capsules contain 180 mg Allisure® AC-23 concentrated natural allicin extracted from fresh garlic. Casing is Non-GMO maltodextrin. Free from artificial coloring, flavoring, salt, gluten and preservatives. Suitable for vegans and vegetarians. Formulation: Size 0 vegetarian capsule containing maltodextrin, gum acacia and allicin. Dosage: Up to 8 capsules per day may be taken if needed, and just one capsule a day of AlliMax with food can be beneficial for health and well-being. It is easily absorbed. The sample pills that were delivered were crushed. The sample packs need to be shipped in protective packaging. The product was nice and gave me extra energy. I started to get the sniffles but it knocked it right out. I tried the pills. I received 3. They seem fine but I didn't notice any real difference in anything. I have arthritis bad. Other ailments. I am sorry but I didn't notice any change. I was a little skeptical at first. Especially with it only being a 2 pill sample, but after just the first one I actually did feel better. (I had a nasty cold when I recieved them) I could tell a big difference in my energy levels too. It just makes you feel better overall, as a whole. Definetly recommend for those that get sick easily.